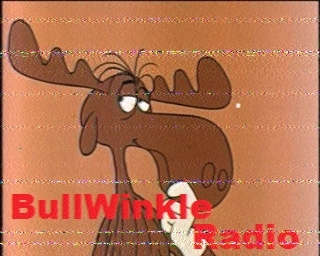 0058 - contemporary dance music, dance beat with music added which went on, 0120 "It's time to shut down the system," SSTV of Bulwinke with "Bulwinkle Radio," cover of Gilligan's Island theme with "Stairway to Heaven" end, 0125 off. 01:06 S-8 on the peaks in WNY. Interesting music. Western New York - Buffalo - Niagara Falls. 0108 UTC: fair signal with electronic music of some sort. It's fading in and out somewhat here. 0118 UTC: the noise floor is starting to swallow up the signal here, as the spacey music with noise effects continues. 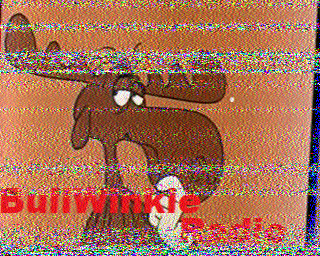 0019 UTC: Spoken ID?, then SSTV.